This time, Rodney Stafford says, the ride will be easier. "I'll have the wind at my back and it will be downhill all the way," he joked. This time, Stafford will also have his son Daryn to help him on the long bicycle ride in memory of his daughter Tori. Rodney Stafford cycled from Woodstock to Alberta last summer in memory of the eight-year-old girl, abducted and killed after leaving school one afternoon in April. His 45-day journey, Kilometres for Kids, raised more than $50,000 for Child Find along the way. The journey ended on Whistler's Mountain near Jasper, a mountain that Tori had once visited. On the top of the mountain, Stafford shouted out, "I love you Chubs!" his nickname for Tori, and released a purple balloon in her honour. Kilometres for Kids 2 -- A Sibling's Story -- will start on that same mountaintop June 20, Father's Day, Stafford said. The journey will raise money for Child Find again, and this time give Daryn a chance to honour his beloved sister, Stafford said. 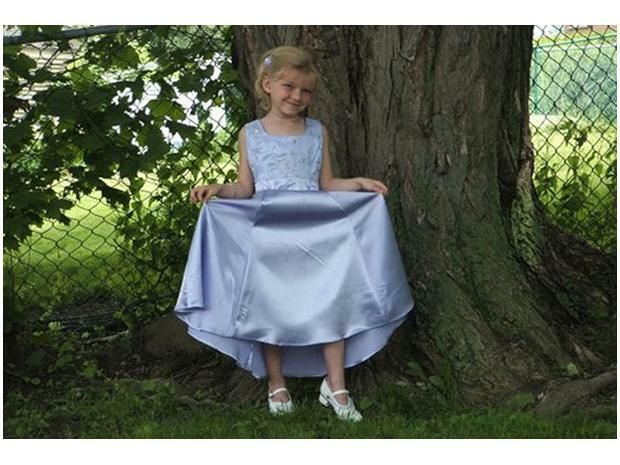 Tori, 8, was abducted after school April 8 in Woodstock. Police and volunteers searched for the Grade 3 pupil for weeks but the arrests in May of Terri-Lynne McClintic and Michael Thomas Rafferty for abduction and murder dashed the hopes of finding the girl alive. Her remains were discovered July 20. On Aug. 5, only days after a private service to say goodbye to his daughter, Rodney Stafford left Woodstock on a bicycle for Edmonton, with a shoe-string budget and help from a couple of friends. Along the way, strangers offered their help, set up fundraisers and contacted local media for coverage. This time, a Facebook page has been set up to help organize fundraising events in cities beforehand. Visit Kilometres for Kids 2 "A Sibling Story" on Facebook for more information. OMG, what a WONDERFUL story! BJ, thanks for the update! I remember reading about the dad going on that marathon days after her memorial and was shocked and enlightend, what great strength he has and the brother for that matter!!! WOODSTOCK, Ont. - A controversial publication ban that shrouded the case of slain eight-year-old Tori Stafford in secrecy was lifted Thursday to reveal that earlier this year Terri-Lynne McClintic pleaded guilty to first-degree murder in the girl's death. The plea, the haunting details of Tori's disappearance and the painful victim impact statements delivered by Tori's family had been under a much-publicized, sweeping publication ban for more than seven months. The Supreme Court of Canada declined Thursday to hear an appeal of a decision to lift the ban, and the heartbreaking story of how the Grade 3 student went missing outside her Woodstock, Ont., school can now be told. Police never released Tori's cause of death, but it was revealed in court that she died of multiple blunt force impacts. McClintic also admitted she went to a Home Depot that day and purchased a hammer and garbage bags. After McClintic pleaded guilty April 30 and court heard victim impact statements from Tori's family — during which time her lawyer brought her a bucket as she was clutching her stomach, appearing to be in some distress — McClintic read a statement of her own. "I didn't wake up that morning thinking I would take a child," McClintic said. "I can't explain my thought process that day... Every day I ask myself, `Why? Why did I tell myself that everything would be OK?' "
McClintic said she was "dealt pretty low cards" in life and had been dealing with issues and problems she didn't specify, and that she resorted to drugs. Her boyfriend, Michael Rafferty, now 30, was charged with kidnapping and first-degree murder. His case has been committed to trial. Clad in a black pantsuit and with her hair in a bun, McClintic read her statement in a meek, but hurried manner in front of the courtroom packed with Tori's family, McClintic's family, police officers and dozens of reporters. McClintic's words took on a bizarre and sinister turn as she talked about what an impression Tori made on her in the brief time they spent together and a bond they formed. "I am honoured to have been able to spend even a brief amount of time with such an amazing person, and it pains me to think about how many people won't get to see what a beautiful and brilliant woman I just know she would have grown up to be," McClintic said. "Tori will never leave my heart. She'll hold my heart in her hands until the day I die." It appears that a horrible confluence of events led McClintic to Tori as her victim, and the innocent child's only mistake was trusting that the woman just wanted to show her a puppy. Victoria went missing on April 8, 2009 and her remains would not be found for more than three months. Tori and her then 10-year-old brother Daryn were living with their maternal grandmother at the time, but Tori was to stay at her mom Tara McDonald's new house close to their school on the night of April 8. Daryn always walked Tori home that school year to their grandmother's house, but that day Tori was to make the short trip to her mother's house by herself. She lined up with her classmates for dismissal at the end of the school day, but ran back inside because she forgot her butterfly earrings. Those earrings would later be used to help identify her badly decomposed remains. Meanwhile, McClintic had spent the day picking up food stamps at a church, buying some groceries, picking up some Oxycontin and submitting her resume at an employment centre. She also tried to check her MSN account on the computer there but forgot her password. Later that day, as McClintic approached Oliver Stephens Public School, Tori happened to be the first child she saw. Tori's brother Daryn, now 12, is suffering enormous guilt for not walking his sister home, their father Rodney Stafford said in a victim impact statement. In his statement to the court, read by his father, Daryn said Tori was the most important part of his world. "She was the closest person to me. Me and Tori could barely be apart for a weekend, let alone a lifetime," he wrote. "Knowing that I'll never get the chance to see her again makes me sad." McClintic told Tori she had a shih tzu named Precious, and Tori replied that she too had a shih tzu and agreed she would like to see McClintic's dog. The trusting, happy little girl told McClintic that her name was Victoria, but everyone called her Tori. The two began to walk away from the school, as now infamously seen on grainy surveillance video, and with that Tori vanished. Soon people across the country would know Victoria's name, and that she liked to go by Tori, because pictures of her smiling face accompanied news stories about the frantic search. After Tori's disappearance many people, including Tori's family, pored over that surveillance video, trying to guess at the identity of the woman. Members of the community suggested it was Tori's own mother, even though she did not fit the height and weight description. Police were almost immediately flooded with tips about the identity of the mystery woman, and a few of those early tips suggested it was McClintic, who was 18 years old at the time. Investigators soon discovered McClintic was wanted on an outstanding warrant for a minor offence, so they arrested her on April 12 — the same day thousands of community members attended a candlelight vigil praying for Tori's safe return. In interviews with police McClintic initially denied involvement, but eventually admitted responsibility and provided them with several hours of statements. She was charged on May 19, 2009 with kidnapping and accessory to murder, which was later upgraded to first-degree murder. The Crown dropped the kidnapping charge, which is not unusual when someone pleads guilty to a more serious charge such as first-degree murder. Before McClintic was sentenced on April 30 Tori's family members were given the opportunity to make victim impact statements. Victoria's father, Rodney Stafford, sat in the witness box, faced McClintic and said he feels a hatred toward her like he has never felt before. Then he uttered astonishing words coming from the father of an eight-year-old murder victim. "As hard as this is for me, I do have to say thank you to you… it has been said that without you we may never have found Victoria," he said. After her arrest McClintic tried to help the police locate Tori's remains. "Maybe one day I can learn to forgive you, but for now excuse me if I don't," Stafford said as McClintic buried her head in her hands. "My little girl is gone." Tori's mother, Tara McDonald, said she is plagued by nightmares because a piece of her will be missing forever. "I miss her so much that many times if I didn't have my son I probably would have taken my own life," McDonald said. McDonald's mother, Linda Winters, and boyfriend, James Goris, also wrote statements and Rodney Stafford's mother Doreen Graichen and his sister Randi Millen did videotaped statements, which were played in court. Though McClintic may one day walk free, Tori's family will never be released from their horror, Graichen said in her statement. "We've all become imprisoned for life," she said. "Our sentence will never end." A life sentence with no chance of parole for 25 years is automatic for a first-degree murder conviction. McClintic may apply for the so-called faint hope clause after 15 years. Rainbow you have done an excellent job updating all these thread today. Thank you. You're welcome, LM, and thanks for posting that beautiful video tribute! It is such a heart-breaking story, but I'm so glad that they finally caught the "monsters" who destroyed the life of such a precious girl. She may be gone from this earth, but her spirit lives on! Thank you LM for such a beautiful video! Thank you too Rainbow for all your hard work! Yes. ladies for the updates and videos! This is one of the, sadly, many cases that pulls at my heart strings. This just makes me so sad for this family and for her poor little brother who I hope will at some point understand he is NOT responsible for not walking her to the Mother's house. mommyof3kids wrote: OMG, what a WONDERFUL story! BJ, thanks for the update! I remember reading about the dad going on that marathon days after her memorial and was shocked and enlightend, what great strength he has and the brother for that matter!!! The father reminds me a bit of Marc Klass, strong and determined. Speaking of determined, Jessie Lumsford's dad was on tv recently. His little girls death made him a stronger man, an advocate for children....he looks like a different person. Strong and self assured. I hope her dad finds some comfort by talking about her, getting media attention for her and all of our little angels. His going on the marathon, I'll bet every step he ran was for her. I fear I am starting to become very bitter with the onslaught of these types of things happening far too often. Once, is too often. I do not subscribe to the " at least they have closure" or "shes in a better place" type of coping. Nothing can bring them back, and though vengeance won't either an eye for an eye is more Justice than the courts are dishing out to these monsters. In Canada we do not have the death penalty. I wish that would change. Some people don't believe in the DP due to religious practices and some don't believe in it because they feel that a lifetime in jail is a lot harder. According to testimony, those were among the last words uttered by the sweet, young girl who was brutally and senselessly raped and murdered in 2009. The man who stands accused of the first-degree murder, sexual assault and abduction of Victoria Stafford in the case, has pled not guilty. His monster of an ex-girlfriend, Terry-Lynne McClintic, is already serving at least 25 years in prison for murder and her role in the macabre tale she told of two drug addicts, who lured the little girl away as she walked home alone from school in April, nearly three years ago. Why are the media describing, down to each swing of the hammer, the last hours of Victoria’s life? Stafford, who has a matter-of-fact way of speaking, has had regular contact with the media since his daughter disappeared and hasn’t shied away from sharing his pain publicly since the trial began. Even as he sits in the court room, day in and day out, hearing the atrocities his little girl went through, he has had the courage to remind the rest of us to do all we can to protect our children. Certainly, people feel sick to their stomachs when they read how Victoria held the hand of her convicted captor and murderer as she was, according to McClintic’s testimony, given back to the other accused, to be raped. Or how the little girl stained the snow with blood after going to the bathroom. You don’t need to be a parent, or have a young child in your life, to cringe or cry at these details. But as uncomfortable as they are, the public needs to know them. One of the reasons we have an open court system is to assure the public that justice is being done for the victim as well as the accused. Is it a perfect system? Absolutely not. But the facts in each case, no matter how horrendous the crime, can have a profound impact on the resources governments and law enforcement will put toward solving similar crimes in the future. And what if this testimony had been suppressed? There would be outrage not just from the media, but the public. When opening the trial earlier this month, Justice Thomas Heeney spoke candidly to the jury, and by extension the public, warning the evidence to be presented to them “could be considered graphic and disturbing.” An understatement if there ever was one. As some channel their anger towards the public nature of the testimony, others are talking about punishment, and whether it suits the crime. McClintic is serving life in prison, but will be eligible for parole after 25 years. Many Canadians believe life in prison should mean just that — LIFE. If you’ve taken the life of an innocent person, you should forfeit your freedom, forever. I would take it further in cases like this. I would want the same type of justice bestowed upon those convicted of such crimes as was meted out to Mussolini, who was shot and then hung in the town square, so his mutilated corpse would endure further humiliation. But we are too polite for such things in Canada. There is no such thing as an eye for an eye in our society. So for now, let’s try to erase the ugliness of Victoria’s last hours from our minds, and remember her wearing her favourite colour purple, her sparkling blue eyes and the butterfly clip in her hair. Details we also know from this trial, that have made Victoria everyone’s child. Surely they will NEVER let her out after this description of what she did to and didn't do for this precious little girl!! I agree with you lisette. This is a Horrible Case. That McClintic person is deranged IMHO!!! This case just breaks my heart every time I read about it again!